The Cinnabar Foundation was an idea long before it became a reality. When founder Len Sargent went looking for a secluded spot to spend his retirement years, he found it at the end of a road in Cinnabar Basin. What became the Sargent Ranch was situated adjacent to a significant remnant of America’s pristine wildness — land that was protected through forest reserves by an early wave of progressive conservationists to wrap a degree of public protection around the north flank of Yellowstone National Park. When Len and his wife, Sandy, and her two children moved to Cinnabar Basin, we all became their public land neighbors. Although the notion of a quiet sanctuary might have passed through Len’s mind, it was not written in the stars. The cosmic alignment with progressive conservation was too strong to remain dormant for long. When the “energy crisis” of the 1970s shook America, the government response was to partner with corporations and promote turning southeast Montana and northeast Wyoming into the boiler room of the nation. To cool the contemplated burning of the carbon-at-rest we call coal, corporate America and its government partner proposed to harness forever one of the longest free-flowing rivers in America — the Yellowstone. Tributaries that feed this majestic river also nurtured the Sargent Ranch. 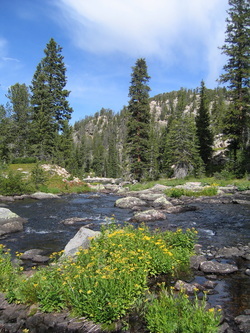 So, intrinsically connected to the Yellowstone through these mountain creeks, the Sargents chose to go with the flow by committing to preserve this great river. In doing so, they joined in a seven-year struggle to stop the proposed Allenspur Dam in the scenic Paradise Valley. When the environmental battles of the 1970s ended, the Yellowstone River was protected, Montana had rewritten almost all of its natural resource and environmental laws, and had put the icing on the cake by giving its people the constitutional right to “a clean and healthful environment.” The Sargents’ participation was a blend of personal activism and significant financial support for grassroots activists who responded to the challenge of those times. In the 1980s, inspired by Thoreau’s dictum, “In Wildness is the Preservation of the World,” the Sargents turned their attention to the long term and founded the Cinnabar Foundation to preserve and protect the natural amenities of “the last best place” in perpetuity. Now more than a quarter century past Cinnabar’s founding, the challenge continues to find a sustainable balance between preserving and protecting our environmental heritage and the demands of an unsustainable and consumptive population. While we acknowledge that this challenge is a permanent dynamic of a free and democratic society, the Cinnabar Foundation is honored to be intimately associated with keepers of our American conservation ethic. We are inspired by the vision of a sustainable "last best place." We are enriched by what we learn from those who advocate for natural and wild things and places. And we are humbled by the courage of brave activists who put themselves on the front line to confront those who would compromise the legacy of conservation passed to our custody from those before us. The Cinnabar Foundation has learned through the years that the Montana and Greater Yellowstone Ecosystem (GYE) we call home is not an accident. It is not a leftover remnant of wildness that economic boomers overlooked or failed to exploit. The lesson we continue to learn is that the Montana and GYE we see today bear the imprint of the conservation ethic first expressed more than a century ago and now given voice by a myriad of grassroots organizations that are willing to stand up and defend wildness and wild places. The Cinnabar Foundation plays a unique role as Montana’s homegrown conservation fund. Recognizing that the challenges ahead loom large, we invite everyone to invest in a Montana conservation legacy that will live on in perpetuity. The Foundation’s permanent conservation fund is an ideal way to sustain and diversify your conservation investment through donations, bequests, legacy gifts and memorial funds. On behalf of future generations, thank you for investing in Montana’s future today.